In 1999 the Choir set up the 'Margaret Rose Bursary' as a tribute to their loved and missed Musical Director, Margaret Burford, who died very suddenly in that year. Initially a £500 Bursary was awarded annually to a young person from the Forest of Dean who intended to take up a career in music. In 2008, to celebrate the 10th Bursary Award, the amount was raised to £750. The choir is very proud of the Margaret Rose Bursary and each year we have been amazed by the immense talent of the young people who take part in the auditions. We continue to keep in touch with those who have taken part over the years and follow their careers with interest, supporting them and giving them a local platform on which to display their various skills. Jack is the Solo Tenor Horn player in Lydbrook Band, a Championship section brass band based in the Forest of Dean. 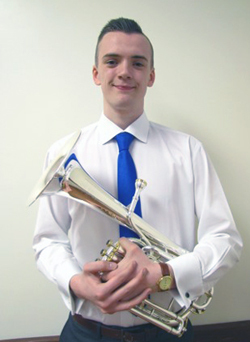 He is also a member of the National Youth Brass Band of Great Britain, currently holding one of the Solo Horn seats. Once he has completed his A-level studies and DipABRSM, he aims to go on to study Musical Performance at University. Jack says that music is important to him because, "It has brought me much pleasure and is something I wish to continue doing to the highest standard possible. It has taught me confidence, respect and how to communicate with people at all levels, skills that can be taken forward into any aspect of my future life."